Celebrating its 50th anniversary season this year, Young People’s Theatre is bringing back many of the most famous plays its has presented. One of these is Théâtre Motos’s utterly delightful show Baobab, written and directed by Hélène Ducharme. The show won the Dora Award for Outstanding Theatre Production for Young People in 2012, but it could have won the award for Outstanding Theatre Production period. Theatre, dance, music, puppetry, staging and design are thoroughly integrated and all combine to tell a compelling story that held its enthusiastic audience of four-year-olds rapt from beginning to end. 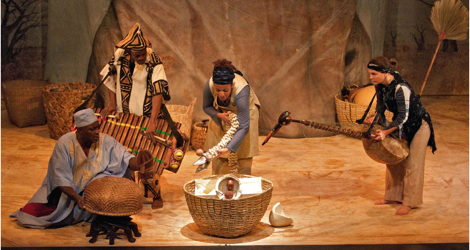 The story is based on West African legends about the importance of water. After creation the sun, who is jealous of the earth, refused to set and created a long period of drought causing the baobab tree to hide itself upside down in the earth. The sun’s meanness causes it to lose its own heart. It is foretold that a hero will come who will find the sun’s heart and when he does so will release the water that has fled from the sun. One day an ancient baobab tree releases an egg and inside the egg is a little boy named Amondo, meaning “The One Who Unites”. The whole village raises the boy in the belief he is its hero. And so he is. From a marabou he learns he must go on a quest and complete four tasks to find the sun’s heart and release the water. The marabou tells him only three of the tasks. The fourth he must discover himself. Amondo is at first daunted by the quest he must make and the expectations of the village, but as the journey continues he finds he has resources in himself he knew nothing about and grows in bravery and cleverness with every challenge. The story thus creates a wonderful parallel between Amondo’s journey of releasing physical resources for the village and his own journey that releases his intellectual and moral resources. As the audience enters the theatre, it is treated to the music of the kora, a 21-stringed cross between a lute and a harp, played by Nathalie Cora, and the balophone, a type of xylophone with gourds as resonators, played by Aboulaye Koné. Against the delicate melodies of the kora, Koné periodically burst into manic playing of the balophone that sets off fits of laughter in the children from the start and establishes the generally comic tone of the piece. Widemir Normil as the genial griot, or village storyteller appears and the show begins. The stage design by Ismaïla Manga and Ducharme features a large paining on canvas of a a baobab. The mythological background of the story of the sun and the earth is illustrated by shadow puppets behind this canvas. The characters are created in a wide range of highly inventive ways. Amondo is a wooden bunraku-style puppet manipulated and sensitively voiced by Sharon James. The wise marabou is Cora covered head to toe in a colourful shaggy costume with a puppet head manipulated from inside. The snake is a braided strand of rope with a metal head. The spider is an eight-legged wicker stool. A black-headed crane is created by sticking a head onto the neck of the kora and a fan propped behind Cora. The one character who most delighted the children was Amondo’s enemy, a mandrill, who is the guardian of the baobab. Narrator Normil plays this role himself in a clever costume that covers the head and back and ends in the mandrill’s prominent red buttocks. The very variety of means in creating these characters suggests the richness the of the world of the play while it stimulates the imagination of the audience. After seeing such an inventively staged low-tech show like this, one wonders why producers think only high-tech shoes will appeal to children. The greatest effects were the simplest. 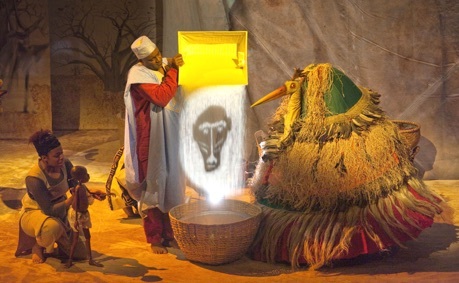 The apparition of Amondo’s enemy the mandrill is created by a show cast on a cascade of falling rice. The ending when the water is released and it finally starts to rain was beautifully imagined by having one actor after another pour dried beans from one basket held at a height into another, making exactly the sound of heavy rain pelting a roof or the leaves of a jungle. The music is a constant pleasure. There is singing, some of it call-and-response where the audience joins in, thus making it part of the community of the village. Amondo accomplishes his quest but what happens to him at the end is a mystery. The Q&A session after the show found that nearly everyone had a different idea of what happened, the beauty of myth being that all these answers are right. For many in the audience this was the first-ever play they had ever seen. I could only think how lucky they were to see such a joyous show that appeals so much to the imagination and uses such a wide array of simple theatrical means to do so. Thank you YPT for letting bringing Baobab back to Toronto! Photos: (from top) Widemir Normil, Aboulaye Koné, Sharon James and Nathalie Cora; Sharon James, Widemir Normil and Nathalie Cora as the marabou ©2015 Robert Etcheverry.